Quick overview Are we born with our fears or do we learn them? Why do our fears persist? What purpose does anxiety serve? In this Very Short Introduction we discover what anxiety is, what causes it, and how it can be treated. Looking at six major anxiety disorders, the authors introduce us to this most ubiquitous and essential of emotions. Are we born with our fears or do we learn them? Why do our fears persist? What purpose does anxiety serve? How common are anxiety disorders, and which treatments are most effective? What's happening in our brain when we feel fear? And what are Colombian worry dolls? 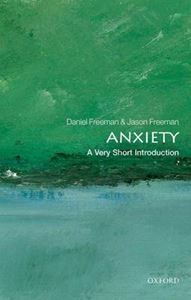 This Very Short Introduction draws on the best scientific research to offer a highly accessible explanation of what anxiety is, why it is such a normal and vital part of our emotional life, and the key factors that cause it. Insights are drawn from psychology, neuroscience, genetics, epidemiology, and clinical trials. Providing a fascinating illustration of the discussion are two interviews conducted specifically for the book, with the actor, writer, director, and television presenter Michael Palin and former England football manager Graham Taylor. The book covers in detail the six major anxiety disorders: phobias; panic disorder and agoraphobia; social anxiety; generalised anxiety disorder; obsessive compulsive disorder; and post-traumatic stress disorder. With a chapter devoted to each disorder, Daniel and Jason Freeman take you through the symptoms, prevalence, and causes of each one. A final chapter describes the treatments available for dealing with anxiety problems. ABOUT THE SERIES: The Very Short Introductions series from Oxford University Press contains hundreds of titles in almost every subject area. These pocket-sized books are the perfect way to get ahead in a new subject quickly. Our expert authors combine facts, analysis, perspective, new ideas, and enthusiasm to make interesting and challenging topics highly readable.